Welcome to SalmonQuest™. SalmonQuest offers salmon fishing lets and holiday packages on selected salmon rivers and beats in the Northern Highlands of Scotland. This site is also the parent site for SalmonQuest's AlnessFishing.com and CononFishing.com sites, and provides a summary of salmon fishing opportunities and fishing holiday packages detailed on those sites for the River Alness and River Conon. In addition, we occasionally have salmon fishing lets & packages from beats on other rivers in the Northern Highlands. For further information regarding salmon fishing on the Alness and Conon rivers, please visit their dedicated websites at AlnessFishing.com and CononFishing.com by selecting from the menu above or from one of the Quick Link buttons below. For further information regarding guided salmon & trout fly fishing experiences, instruction & short breaks visit TroutQuest. If you are touring the NC500 this year and plan to salmon fish, check out our new website NC500Fishing, a directory and information resource for anglers visiting the Northern Highlands including essential info on salmon day ticket waters. Or visit our NC500 fishing page on this site, where you can download our Visitor's Guide for Salmon Fishing on the NC500. Catch us on the way out or back! Want to know about last minute salmon fishing availability or special offers? Follow our Twitter feed. Check out our TroutQuestTV and SalmonQuestTV channels on YouTube to see short videos of our guests, fishing for trout and salmon. Our Pinterest boards aim to provide useful information for visiting salmon anglers. 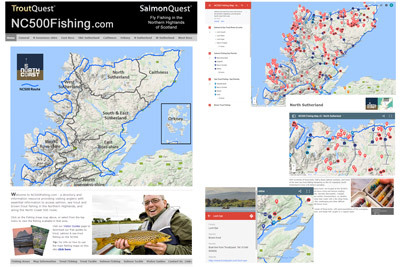 General info relevant to Scottish salmon fishing, and selected fishing availability. Follow SalmonQuest's board Alness Salmon Flies on Pinterest. Follow TroutQuest on Instagram to see the latest photos from their fly fishing excursions and experiences.